As an author, one of the best ways to maximize sales for seasonal content is to prepare and submit it ahead of time. Our sales data suggests that buyers typically search for, bookmark, and purchase seasonal content about 1 - 2 month before the actual holiday date, the Christmas season can even start as early as October. To make sure that your item can be reviewed and published to the Market sites at the time our buyers are in demand for it, we recommend you submit your item(s) about 8 - 12 weeks prior to the date of the event. Please note that the recommended timeline is merely a suggestion to benefit you, and the time required to review your items may vary. Generally speaking, the more you plan ahead and the earlier you submit, the greater chance you have of maximizing your potential sales! The current average review wait times can be viewed here. The wait times listed should be used as a guide only as it may take more or less time to review your item(s) depending on a number of factors. In particular, seasonal increases in item submissions will generally increase the review wait times. For your convenience, we have highlighted some of the major holidays around the world in the table below. 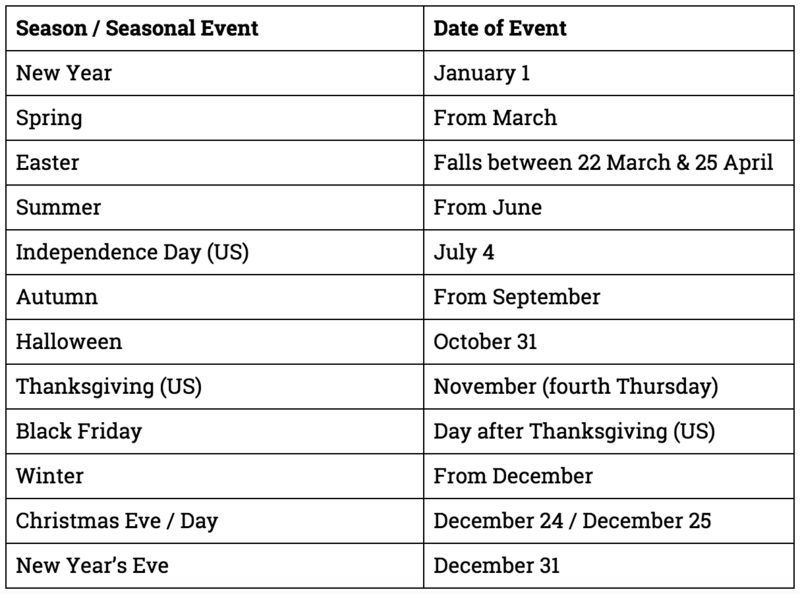 For more detailed events around the world however, please refer to Time And Date.com and be sure to change the country to see each different set of national holidays and events.